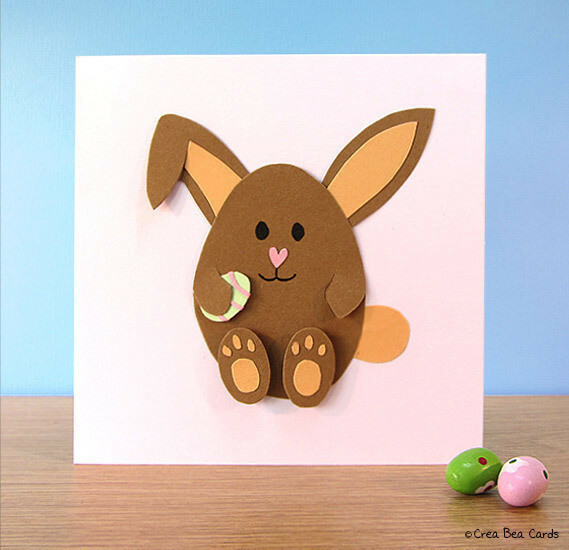 Craft this cute card for Easter. The Easter Bunny brings decorated eggs every year. Speaking about eggs, he’s apparently one by himself this time! Just follow the tutorial and craft this cute bunny all by yourself. 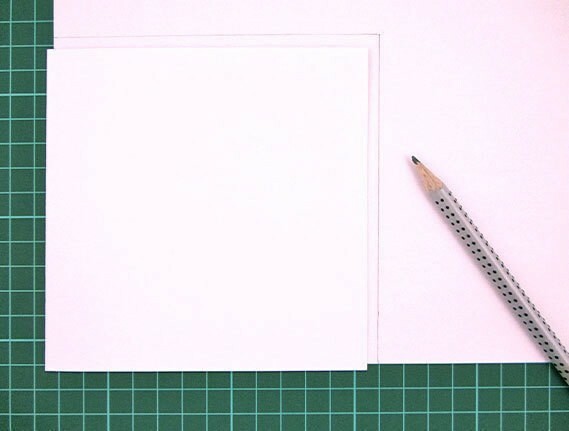 Put a blank greeting card on a sheet of white paper and trace it with a pencil. This way it’s easier to see what size your Easter bunny should be. 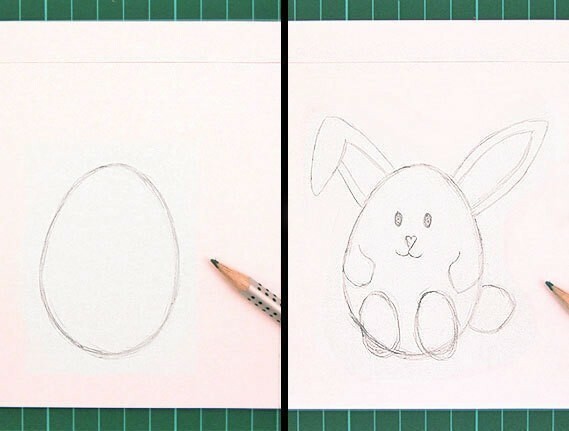 Remove the card and draw an egg shape within the traced area. After that you draw the bunny ears, face, arms, tail and feet. Cut out the egg shape with a scissors. Do the same with the bunny ears & tail. Put the egg & ear shapes on a piece of brown paper and trace them with a pencil. Make sure the ears and tail shapes are a bit longer than they should be. This way it’s easier to attach them to the egg shape later. 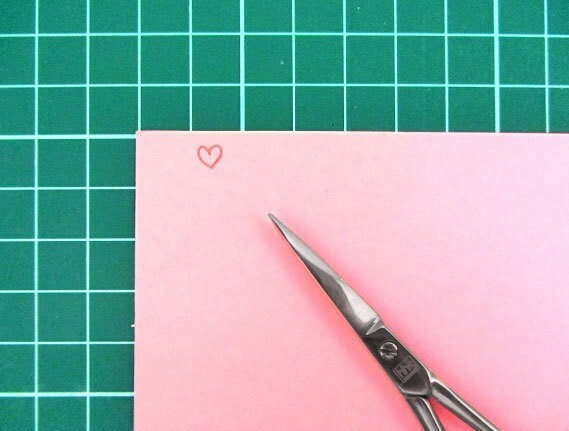 Cut them out carefully. Remove any remaining pencil line with an eraser. Take the egg & folded ear shape. Put the original white shapes on top of them. 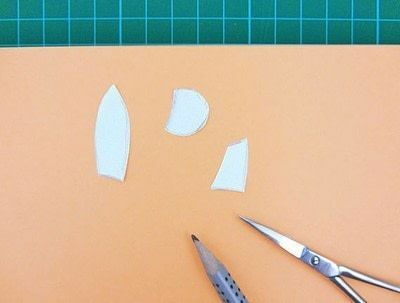 They will serve as your cutting pattern. Carefully cut the folded ear and the two arms by following the pencil lines. Take the white ear shapes. 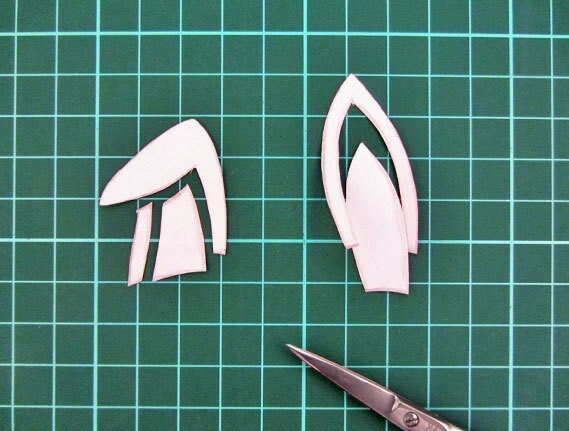 Cut out the inner ear parts with a scissors. Take the white shapes of the inner ear parts and tail. Put them on a piece of light brown paper. 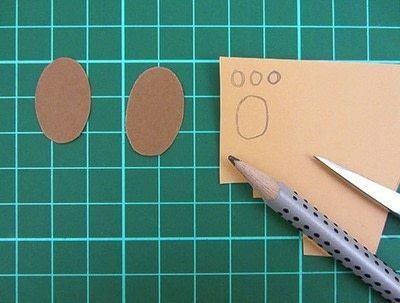 Trace them with a pencil and cut them out. 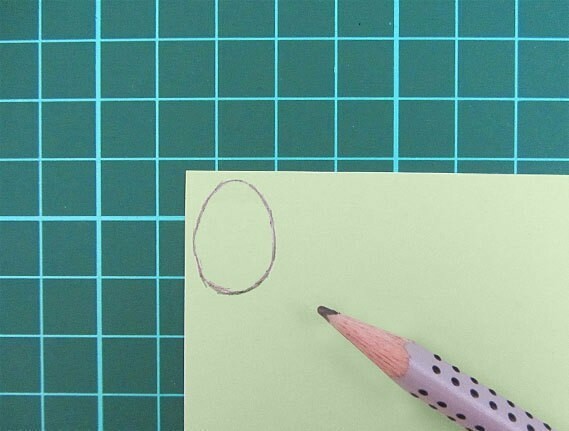 Remove any remaining pencil lines with an eraser. Step 8: Glue the inner ear parts onto the ear shapes. 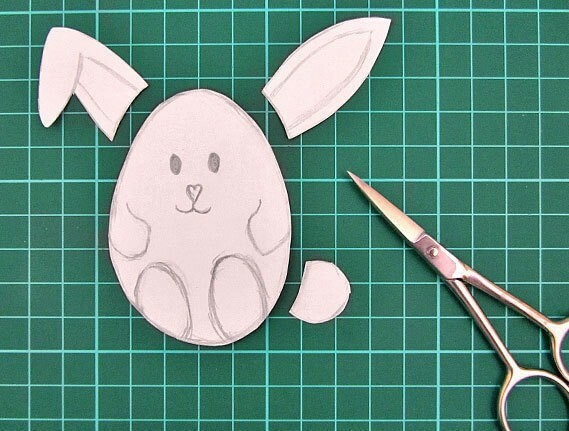 Take the white paper which you used for cutting out the bunny shape. This will serve as your template. 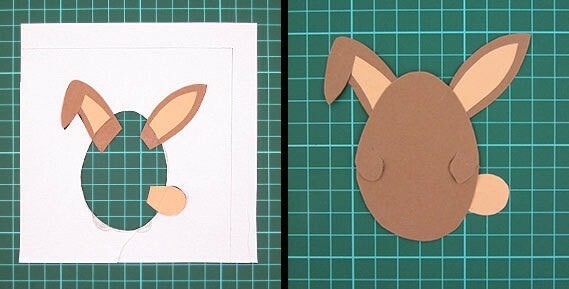 Put glue on the bunny ears & tail and put them in the right place inside the template. Put the egg shape inside the template and softly press it. The 4 shapes are now attached to each other. 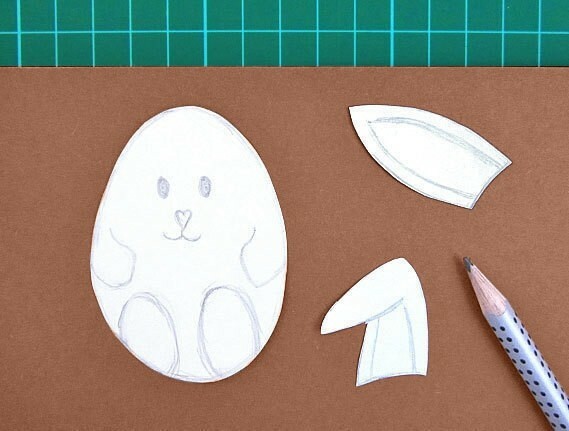 Take the white egg shape and cut out the feet parts. You can toss these feet parts away, since they aren’t rounded. (The feet stuck out of the egg shape in your sketch.) Therefore you use the white egg shape as a template now. Trace the feet area with a pencil. The result: two oval-like shapes. Put these two shapes on a piece of brown paper. Trace it with a pencil and cut it out. 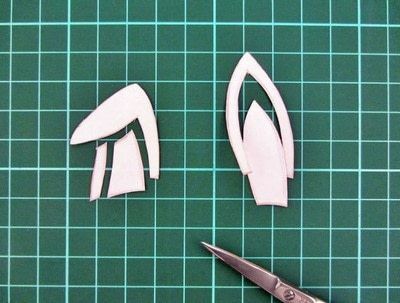 For each foot you cut out 4 footpad parts. Three small ones and one big one. 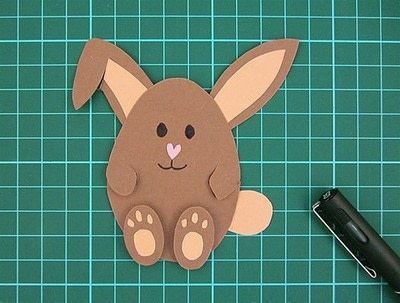 You can draw & cut out these directly from the light brown paper. Glue them carefully onto the foot. 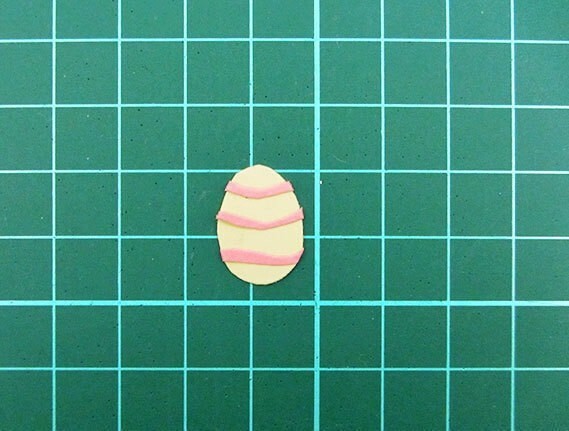 Use 3D stickers to attach the two feet to the egg part. Make sure they stick out a bit to make it look more realistic. Cut out a small heart from a sheet of pink colored paper. 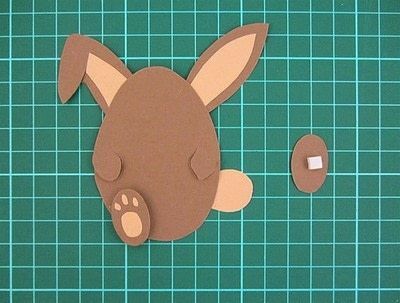 This will serve as the bunny’s nose. Glue it to the egg shape. Draw the eyes and mouth with a black pen. Make the bunny smile! 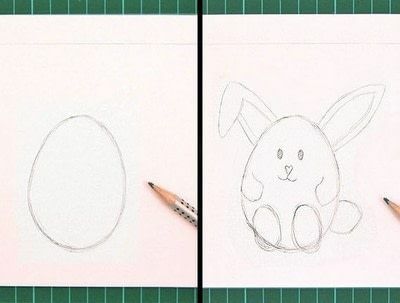 Draw a small egg on a sheet of colored paper of your choice. 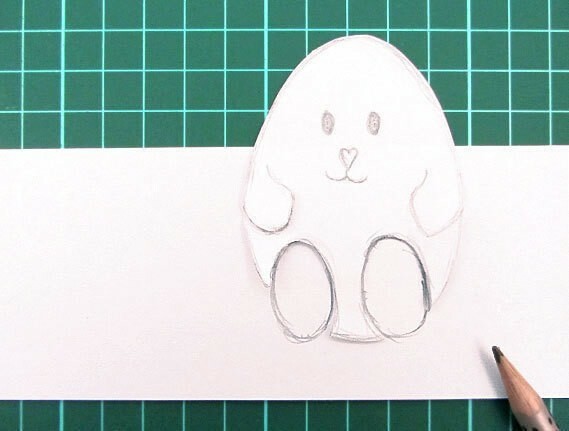 Cut out this shape, it will serve as the Easter egg. Decorate your Easter egg by using a different colored sheet of paper. I made decorative curves and glued them onto the Easter egg. Put double-stick tape on the backside of the left arm or glue it. Attach the Easter egg to it. Now your Easter bunny is holding the Easter egg. Glue the Easter Bunny onto a blank greeting card now and your card is finished! Aww this is an adorable card!